The ocean supports the largest reservoir of carbon in the global carbon cycle and absorbs a large proportion of both natural and anthropogenic greenhouse gases. Processes affecting the equilibration of CO2 concentrations between the ocean and atmosphere are critical to Earth’s climate and ocean sustainability. Our mechanistic understanding of the controls on this equilibration remains poor, largely because the relevant processes involve coupling between physical, biological and chemical processes covering a range of temporal and spatial scales. Numerical models have significantly improved our insight on this topic, but observations are needed to validate these models. Observational strategies will require sampling from a broad range of sensors, which can not be accommodated on a single platform. In 2013-2014, the Keck Institute for Space Studies (KISS) conducted a study to investigate the premise that autonomous and coordinated groups of ocean robots, working in cooperation with remote sensing and shore-based data assimilation, could significantly advance our ability to obtain ocean observations needed to constrain the marine carbon cycle. 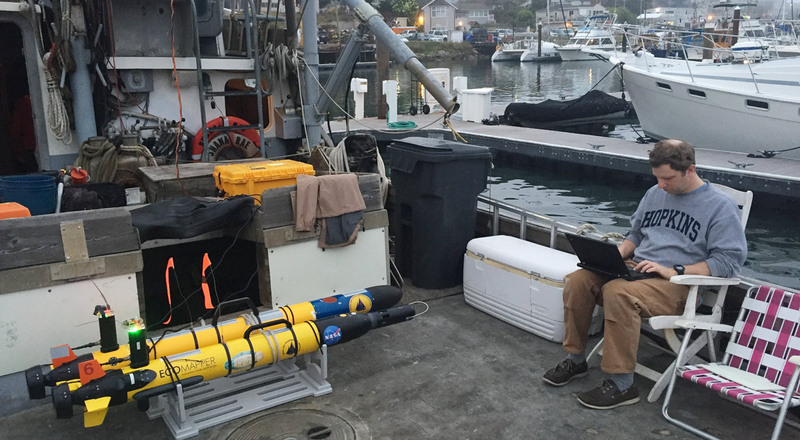 The primary conclusion of this meeting was the need to develop techniques that allow heterogeneous groups of robots to autonomously determine sampling strategies with the help of numerical ocean forecasts and remotely-sensed observations. The application of a heterogeneous array that permits two-way feedback with shore-based models has not previously been attempted. This project will: (1) develop algorithms for maximizing information gain from in situ observations with the use of shore-based circulation and biogeochemistry models; (2) design a framework in which a fleet of heterogeneous ocean robots, both on the surface and underwater, can receive directives from shore-based models that consider the health, sensing, navigation, and communication characteristics of the robots; and (3) implement these methods on existing PI resources, including autonomous underwater vehicles (AUVs), ocean gliders, and autonomous surface vehicles (ASVs), and test them in field experiments. The emphasis will be on scalable techniques that can accommodate large arrays of assets. This work is critical to future observations and exploration of Earth’s ocean and will also benefit future space missions by providing in situ data for satellite remote sensing measurements of the ocean, reducing validation costs for NASA ocean missions, and providing a framework for designing robotic missions to extra-terrestrial ice covered oceans. 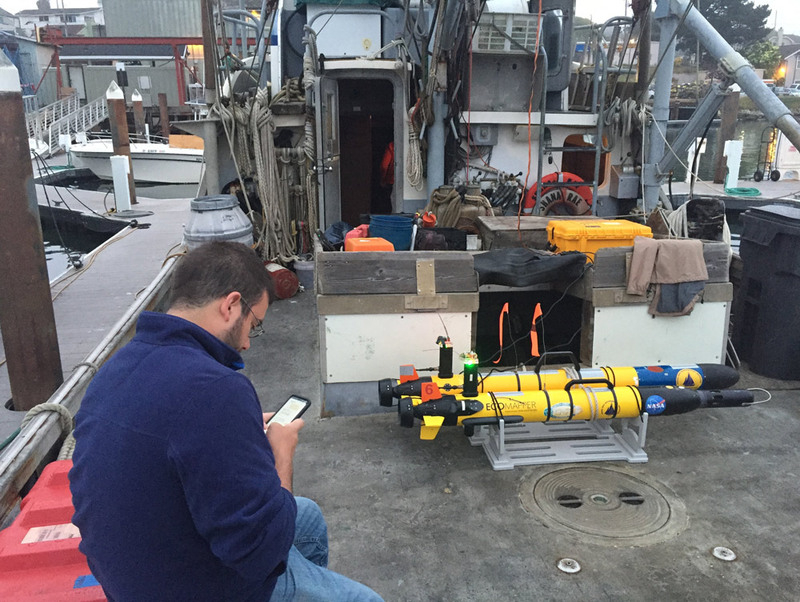 This project builds on expertise from various institutions: the Jet Propulsion Laboratory (JPL) in autonomous sampling and planning; Caltech in physical oceanography; Woods Hole Oceanographic Institution (WHOI) in marine robotics; and Remote Sensing Solutions (RSS) in ocean modeling and remote sensing. Figure 1: Framework to be employed in our proposed research showing the different robots to be employed along with their attributes and sensing payloads. The number of vehicles is in parenthesis. Lines between the boxes indicate communication pathways — dashed lines between boxes indicate in-air Iridium communication pathways; solid lines indicate in-water acoustic communications. The ASV will serve as a communications rely between the AUVs and shore while also providing external navigation aiding for the AUVs via one-way travel time acoustic ranging. 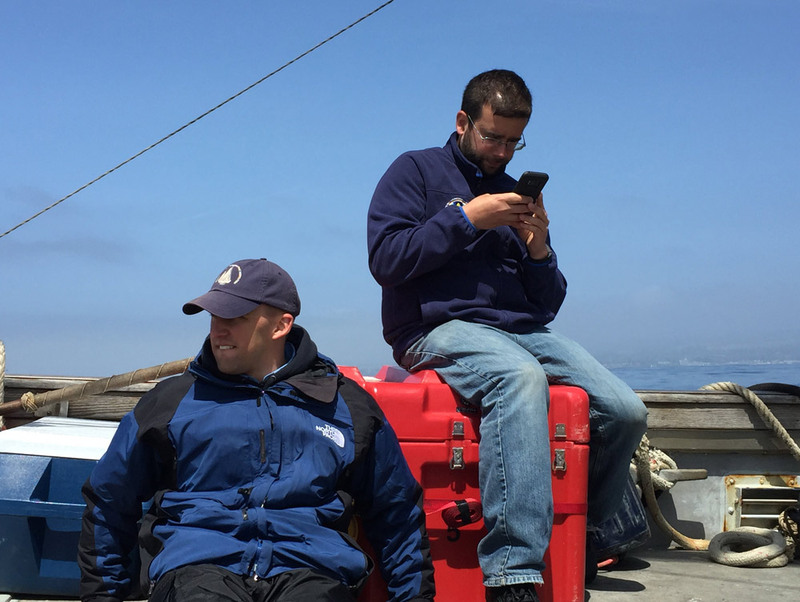 The following is a brief description of the field program that was carried out in Monterey Bay from August 26 to September 4. 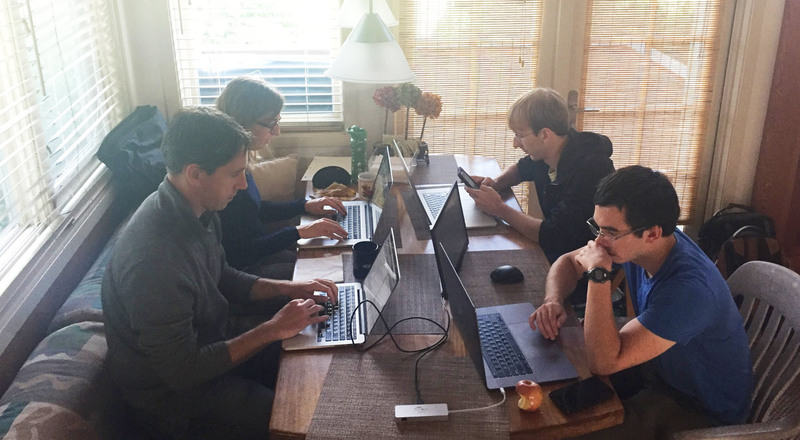 This week would provide the first opportunity to bring together all of the pieces of the observing system that we have been developing over the course of our first year of KISS support. The observing system consists of three elements: (i) a 300-meter resolution ROMS (Regional Ocean Modeling System) free-surface, terrain-following, primitive equationsocean model developed especially for this project; (ii) a suite of planning software that both identifies the location of specific scientific targets based on the ROMS output and autonomously determines the optimal sampling strategy for a heterogeneous array of autonomous vehicles; and (iii) a fleet of three AUVs, two ocean gliders and one Tethys-class Long-Range AUV, the latter through a collaboration with MBARI (Monterey Bay Aquarium Research Institute). The goal of the project was to generate daily forecasts from the ROMS model, based on data assimilated from both our autonomous vehicles and other external products, to target strong frontal and upwelling regions. 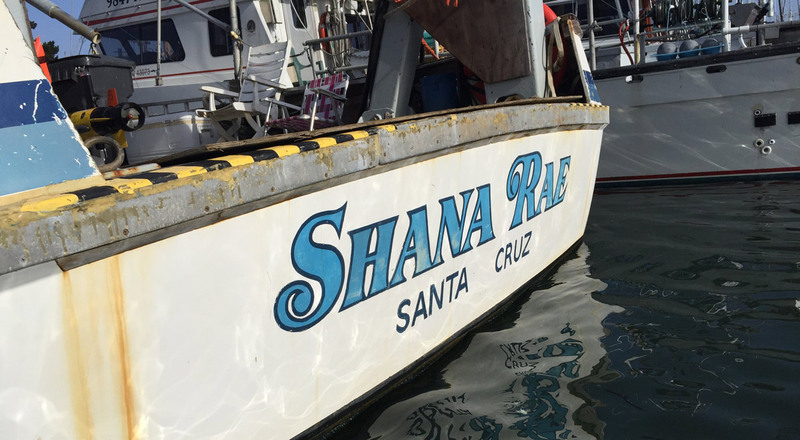 We then worked closely with Jim Christman, caption of the R/V Shana Rae, to deploy our autonomous vehicles at these sites to both validate the ROMS output and to sample the evolving submesoscale circulation at these locations. 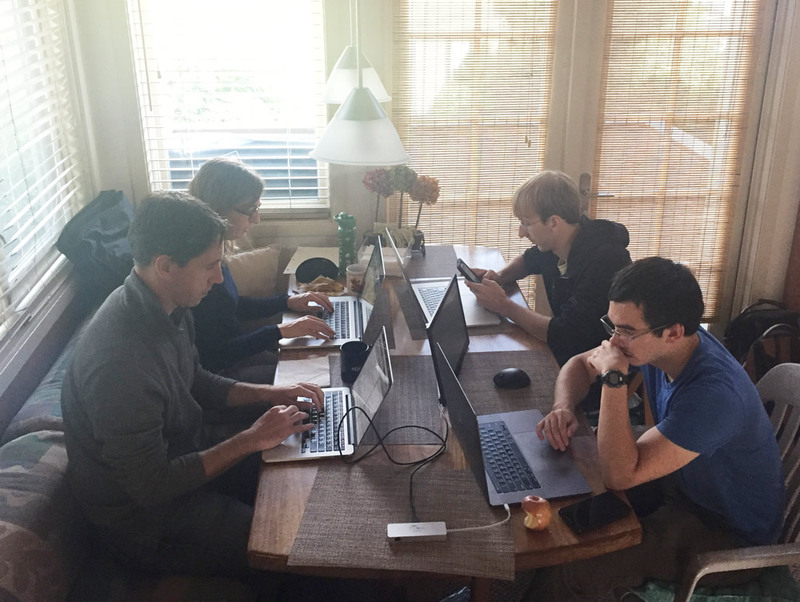 Most of our team arrived in Santa Cruz on Friday the 26th August to find a few of the Woods Hole team members working away furiously in the garage of our home base for the week, prepping the Iver-class Ecomapper AUVs. 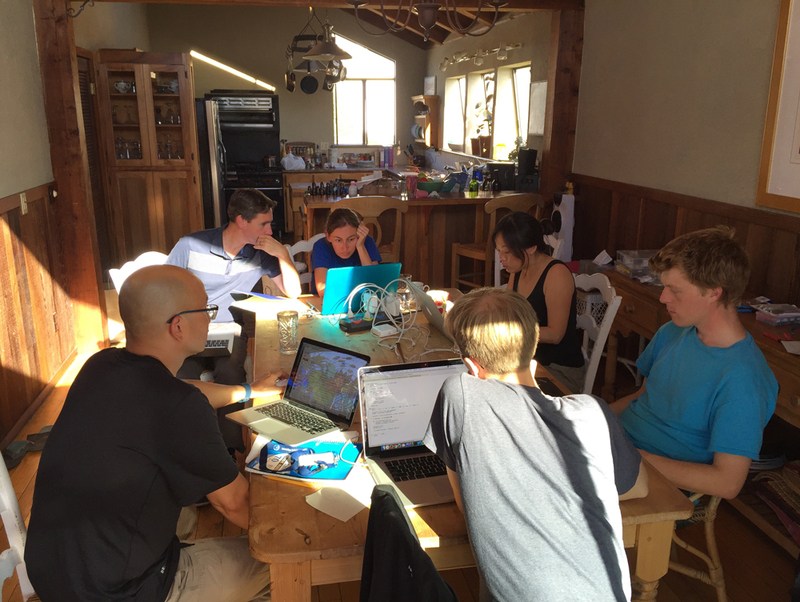 The gliders were deployed earlier in the summer to provide over a month of data prior to the intensive field program. 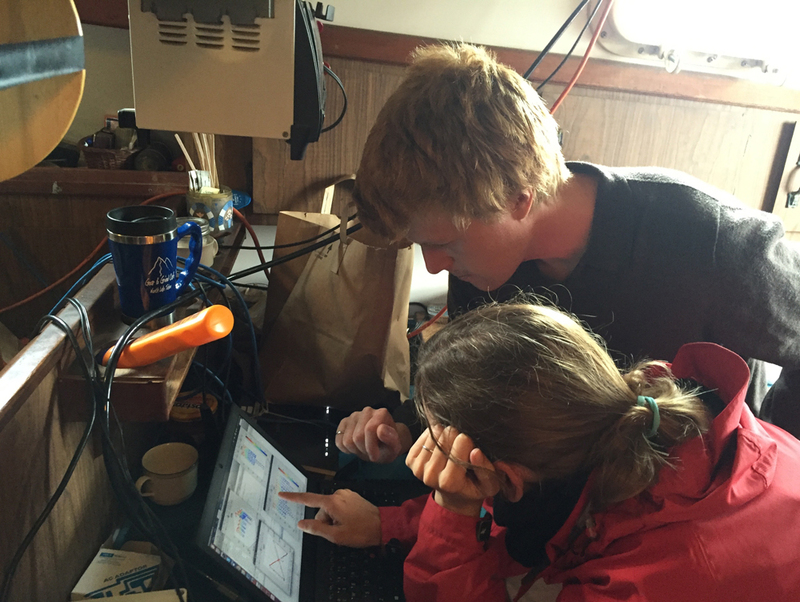 Over the first weekend, we performed some basic tests of the AUVs to confirm their health and to make a final assessment of their endurance. By Monday we had streamlined our on-shore analysis of the ROMS forecasts that were arriving each morning. 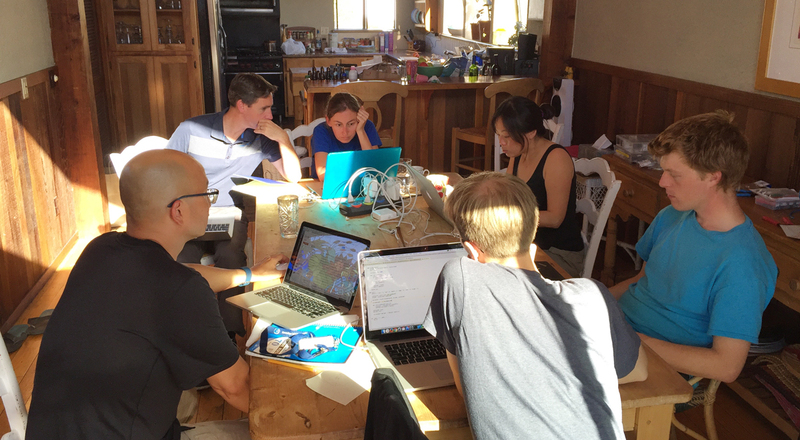 Our team spent many hours during the first few days fine tuning our new feature-detection algorithms. This allowed us to autonomously identify front locations and generate sampling patterns, such that we could pass along our target site for the day and the AUV waypoints before the ship left the dock at 5.00am. We carried out three successful days of targeting upwelling fronts over the continental shelf at the end of the week (Wed-Fri). 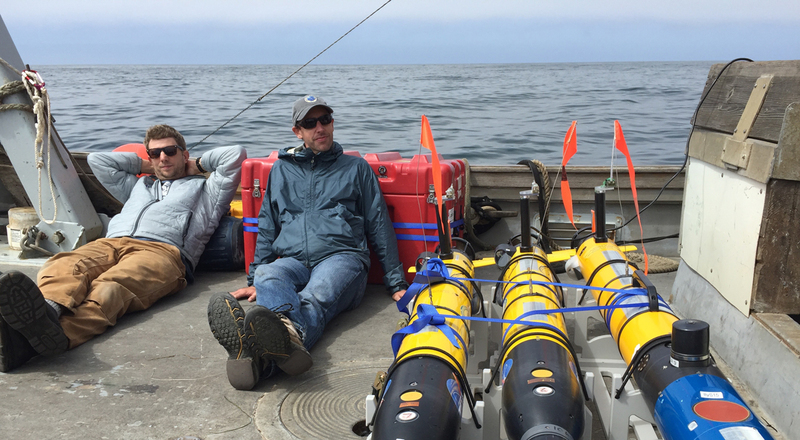 We also worked closely with MBARI to make use of their LRAUV, Makai, which sampled in the same area as our AUVs over the course of the week. This greatly enhanced our data collection during the field program . The only challenge during the week was the unusually strong wind conditions that forced most of our operations to be over the continental shelf rather than in deeper off-shore waters. We are grateful to have worked with Jim Christman and his crew, who provided a steady hand during changeable weather conditions and enabled safe deployments and recoveries throughout the week. Although it was an exhausting week (waking around 4.00 am most mornings to analyze the forecast and often up late into the night processing new data), we are excited about what we achieved in the first year. 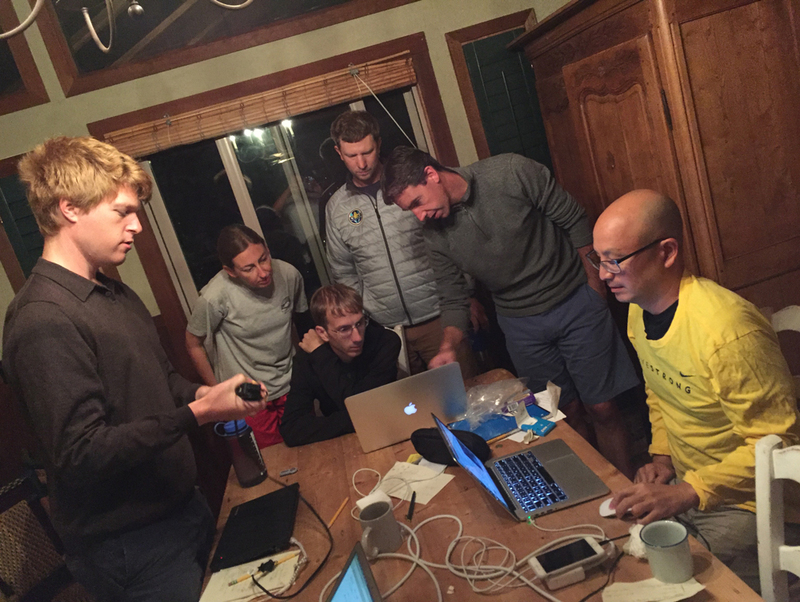 Everyone on the team felt that the week in Monterey Bay was a success and confirmed that our approach, coupling high-resolution numerical model forecasts and autonomous planning algorithms, is a viable way forward for future robotic ocean observing systems. 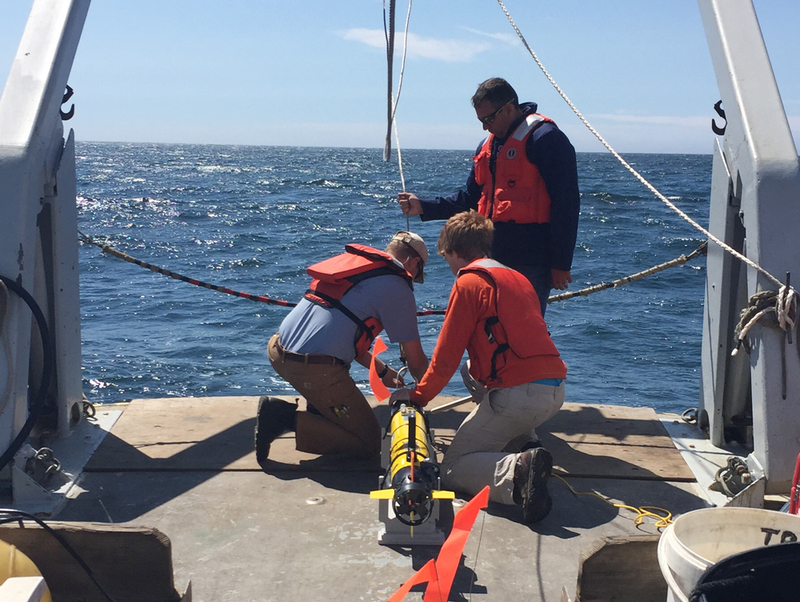 This project will sample the three-dimensional time-varying upper ocean using multiple ocean robots adaptively controlled by on-shore autonomous planning algorithms that exploit information from prediction models, remote sensing data, and in situ data obtained by these robots. The scientific focus is to optimize the robotic sampling capabilities in order to resolve evolving small-scale (submesoscale) ocean instabilities. Design a framework in which a fleet of heterogeneous surface and underwater ocean robots receive directives from shore-based models that consider the health, sensing, navigation, and communication characteristics of the robots. Develop algorithms to autonomously determine sampling strategies designed to maximize information gain and based on a combination of in situ observations and shore-based data-assimilating forecast ocean models. 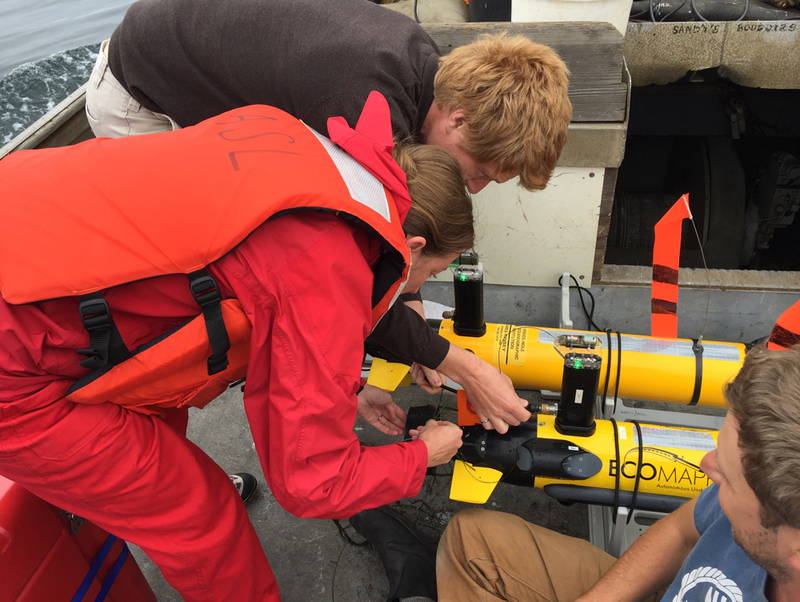 Implement and assess the technologies in a week-long 2016 experiment involving multiple AUVs and both surface Wave Glider and subsurface gliders to observe the physical and biogeochemical dynamics of the upper ocean over a 7 day period. 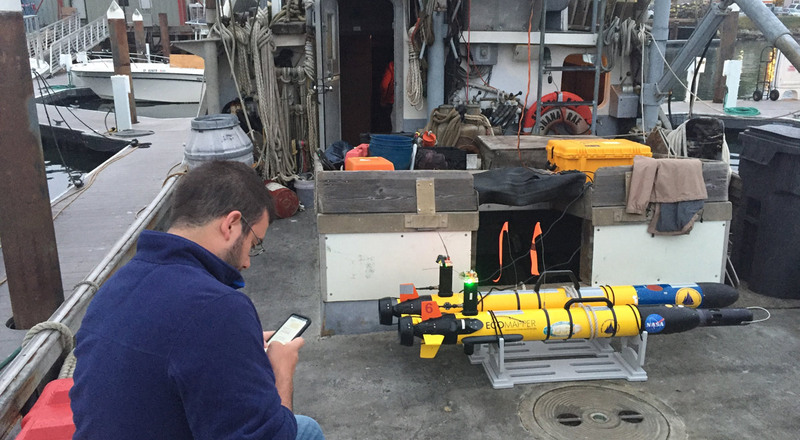 Shore-based adaptive surveying and autonomous planning algorithms will combine data from these robots and remote sensing data with a Regional Ocean Modeling System (ROMS) to plan future robot trajectories. 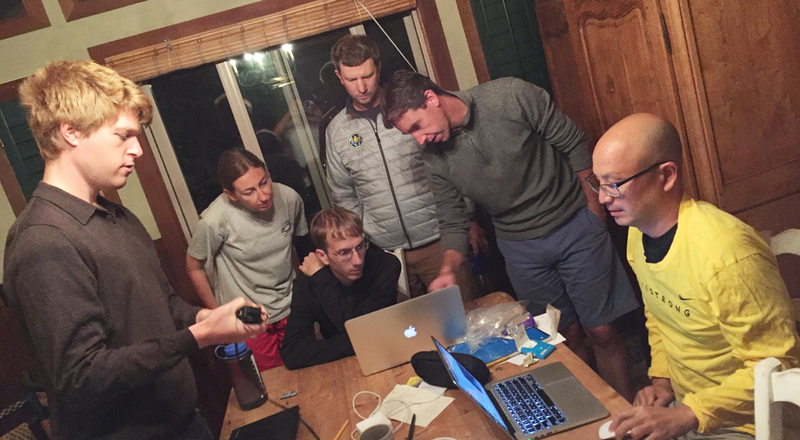 This will work be carried out in collaboration with colleagues at MBARI and will inform the design of a larger field program in 2017. 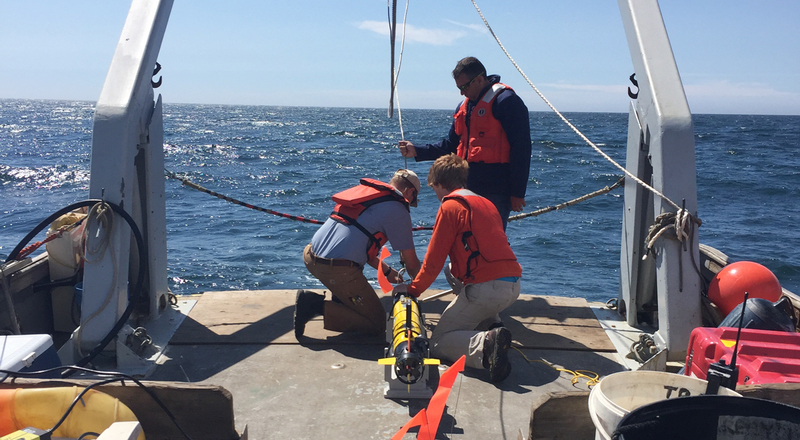 To accomplish the proposed objectives, we will demonstrate the ability of heterogeneous groups of robots to autonomously determine sampling strategies with the help (two-way feedback) of numerical ocean forecasts and remotely-sensed observations (Figure 1 above). 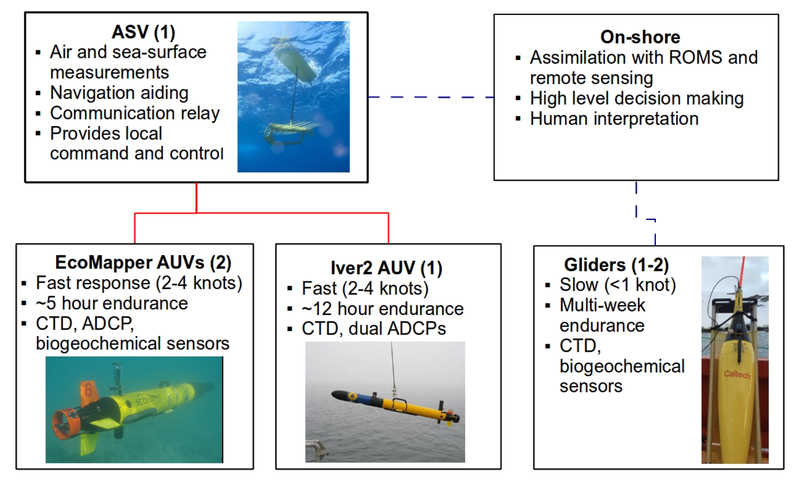 The KISS project will support the following assets (Figure 1): one autonomous surface vehicle, Wave Glider, supplied by Kinsey (WHOI); two autonomous underwater vehicles, Seagliders, supplied by Thompson (Caltech); one high-speed autonomous underwater vehicle, Iver2, supplied by Kinsey (WHOI). The design specifications that provide information on the trade-off space (speed/duration/power) of these assets are shown in Figure 1. In short, the long-duration platforms, surface and in situ gliders, will be deployed prior to and throughout the targeted field study to provide persistent observations of the evolving background field (large-scale gradients and mesoscale activity). 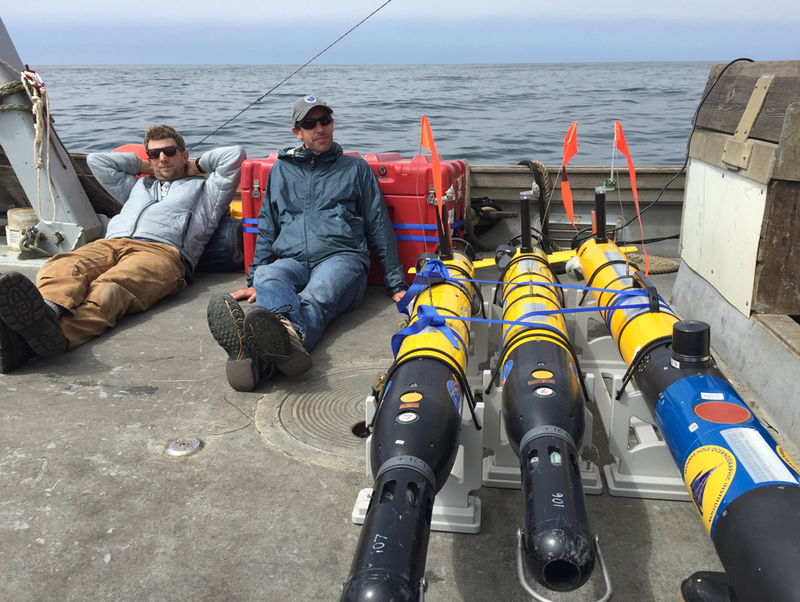 These assets, along with the on-shore modeling efforts, will be used to guide deployment of the high-speed, short-duration AUV(s), which are necessary to provide the high temporal and spatial resolution measurements that will resolve submesoscale processes. OMS is a community-based model designed for regional applications. Over the past decade, a ROMS-based nowcast/forecast system with a spatial resolution of 3 km and 40 vertical topography-following layers has been developed off the coast of California. The three-dimensional variation data assimilation (3DVAR) method is used to assimilate different types of observations simultaneously, including satellite sea surface temperature and height, vertical profiles of temperature and salinity from ships, moorings, floats, gliders and AUVs, and surface current derived from high frequency radars. During the proposed field experiment, ROMS will be run in near real-time providing the planner team with 72-hour predictions of temperature, salinity and current on the daily basis. LLC is a global ocean and sea ice simulation based on a Latitude/Longitude/polar-Cap (LLC) configuration of the MIT general circulation model (MITgcm; Marshall et al. 1997; Hill et al. 2007). Horizontal grid spacing is ~2 km at the California coastal region and vertical levels have 1-m thickness near surface to better resolve the diurnal cycle. The simulation is initialized from a data-constrained global ocean and sea ice solution provided by the Estimating the Circulation and Climate of the Ocean, Phase II (ECCO2) project (Menemenlis et al. 2005, 2008; Losch et al. 2010), and includes atmospheric pressure and tidal forcing (Menemenlis et al. 2014). Surface boundary conditions are from the European Center for Medium-Range Weather Forecasts (ECMWF) atmospheric operational model analysis, starting in 2011. We will use hourly output of full 3-dimensional model prognostic variables. At the present time 5 months of output are available, while 2 years of data is available from a similar simulations at ~4 km resolution. The shore-based planner (aka planner) directs the marine assets to study the phenomena of interest. Specifically it takes as inputs (1) the current locations of the marine assets, (2) a motion model of the marine assets, (3) a science target center-point, (4) a science template to be applied, and (5) a predictive ocean current model (e.g. ROMS), and produces a waypoint-based mission file for each of the assets. When executed within the predicted current model this mission file will optimize the measurements need to observe the targeted science phenomena. The current implementation of the planner [Branch et al. 2016] performs a heuristic beam search in the planner current model space to attempt to (a) arrive in an epsilon-locale of the next leg waypoint determined by the science template, (b) minimize travel time (typically the legs take longer than nominally estimated by the science team), and (c) minimize distance from the science ideal path. 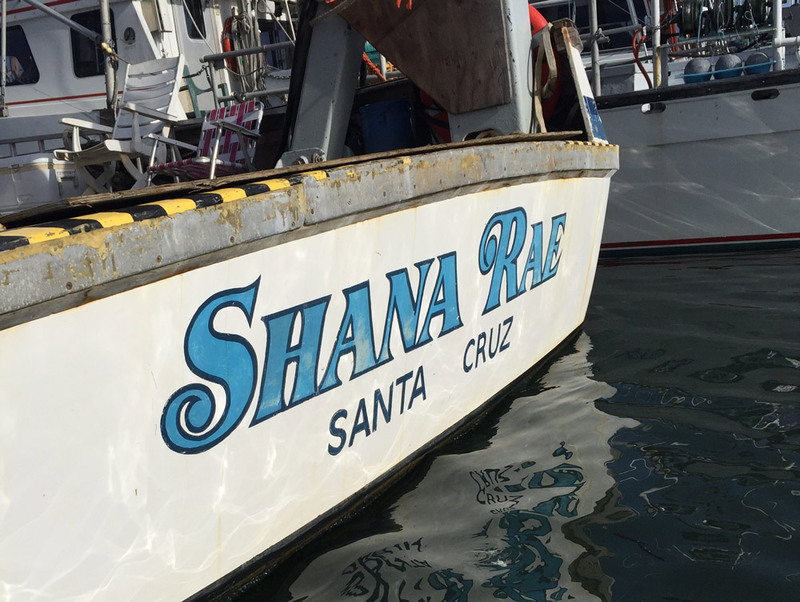 Our year 1 field experiment has been scheduled for August 29 – September 2, 2016 in Monterey Bay. 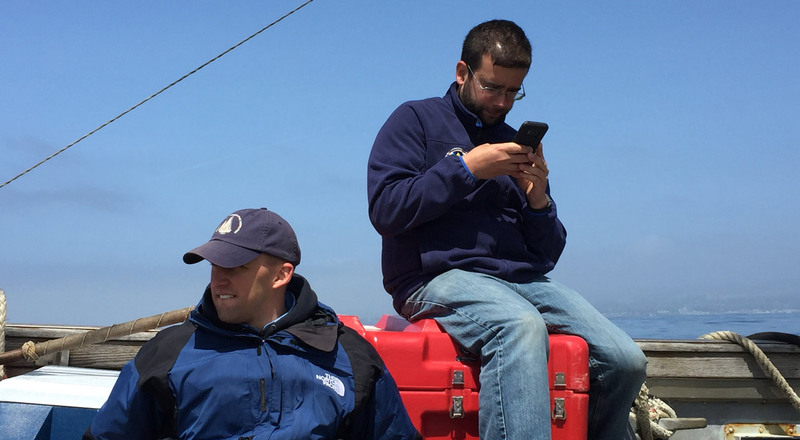 This field work will be coordinated with the CANON (Controlled, Agile, and Novel Ocean Network) experiment with colleagues at the Monterey Bay Aquarium Research Institute (MBARI). 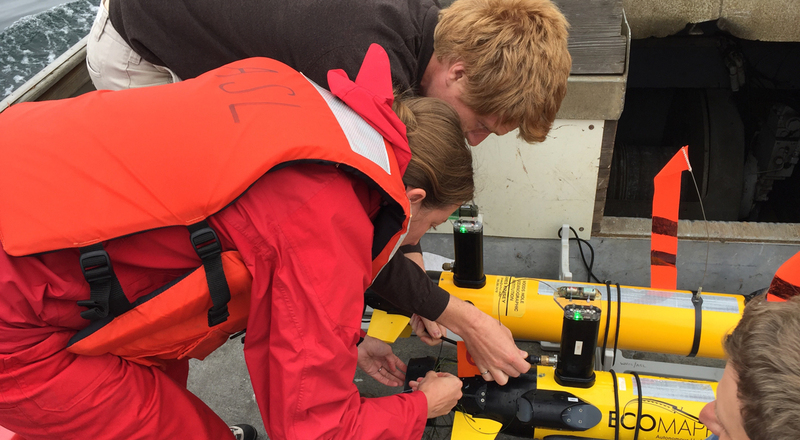 CANON is an interdisciplinary effort that utilizes smart, autonomous devices designed to cooperate with each other to collect time-varying spatial observations of upwelling plumes, associated fronts, and chemical features. 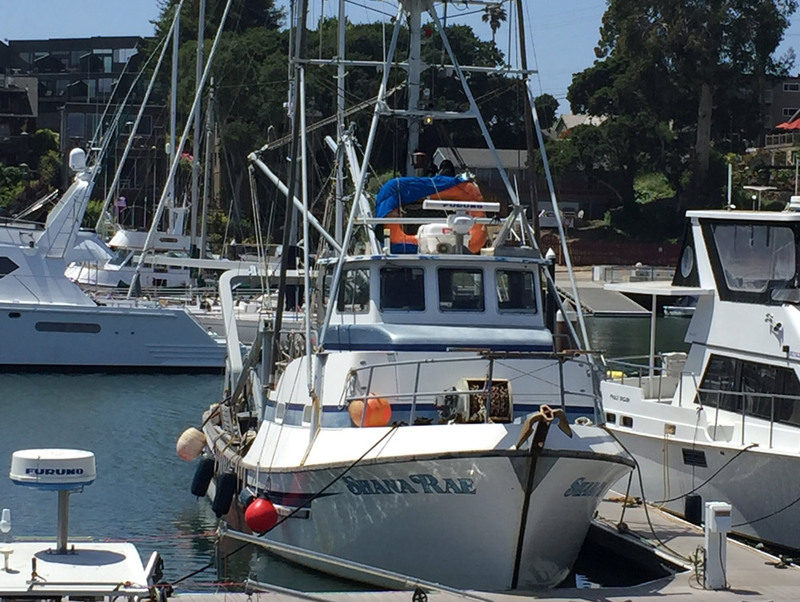 The CANON field experiment will involve three research vessels to deploy/recover autonomous vehicles: R/V Rachel Carson 135-ft (8/31 & 10/11), R/V Western Flyer 117-ft (9/23 – 10/2), and R/V Paragon (a relatively small 36-ft but fast 40-kt max boat available on-demand). In addition to these ship cruises, CANON will also use a number of autonomous vehicles including ASV wave gliders, AUV Slocum gliders, and long-range AUV. We have organized a meeting with CANON PI, Dr. Francisco Chavez, on April 20 in order to discuss our KISS program and the potential for an extended collaboration in which CANON gliders would be deployed with similar science targets and potentially using our planning algorithms. The Science PI (Thompson) will select a science target from analysis of ROMS and satellite data. 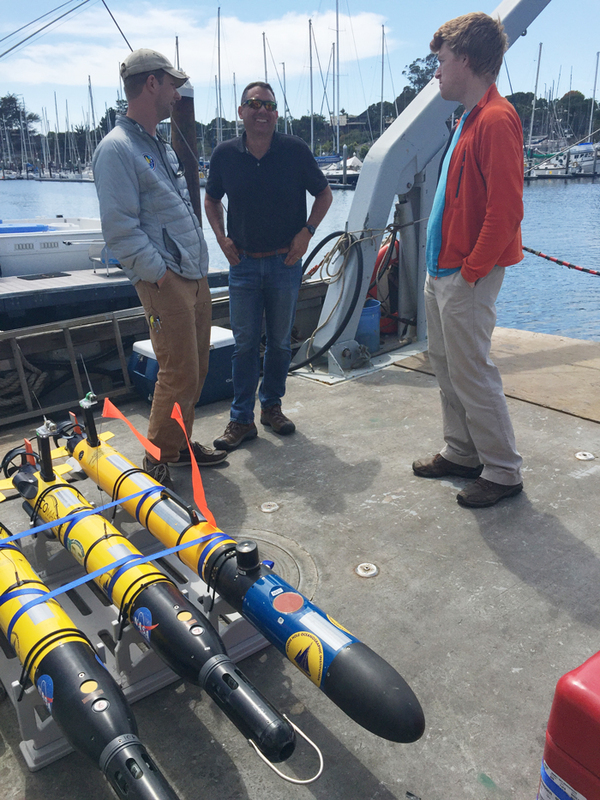 Deployment locations will be determined for extended deployment assets (Seagliders, Wave Glider). Each day, deployment location(s) for the daily deployed assets will be determined on the basis of data collected during the prior day as well as forecast data by the shore planning software. The shore planner will continuously generate mission files for commanding each of the assets (Seaglider, Wave Glider, AUV). The shore planner infrastructure will continuously generate simulated in-situ collected data (from the ROMS simulation) for each of the in-situ assets. When able, the Science PI will adjust the science target, incorporating simulated in-situ data as well as other available data (e.g. satellite). Off line, as available, JPL will operate the science target detection software using inferred mix layer depth and other ROMS quantities. The determined targets will be evaluated by the science team as available. 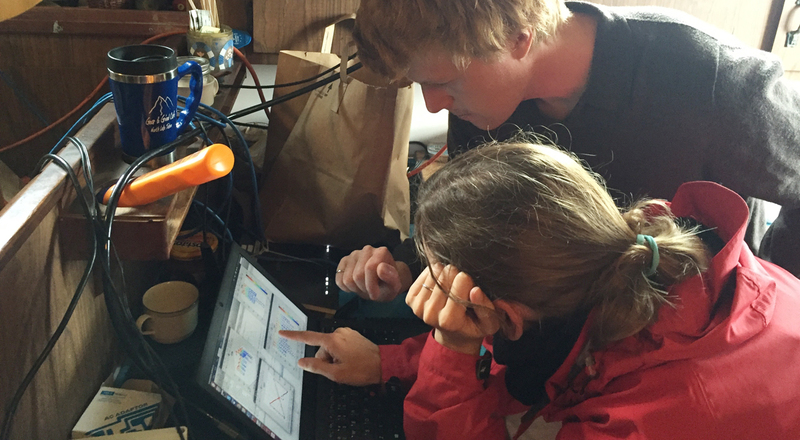 train and prepare the operations teams to smooth operations for the field experiment. Thompson and Kinsey have provided Chien and our JPL colleagues with detailed descriptions of the instrumentation software, piloting algorithms and input and output file formats. This will enable the planning software to be designed to interface with the heterogeneous observing platforms. This was a key first step in progressing towards the virtual deployment planned for the end of April. Thompson and Kinsey have also been finalizing plans for the preparation and shipping of the instrumentation to Monterey for the start of the field program. 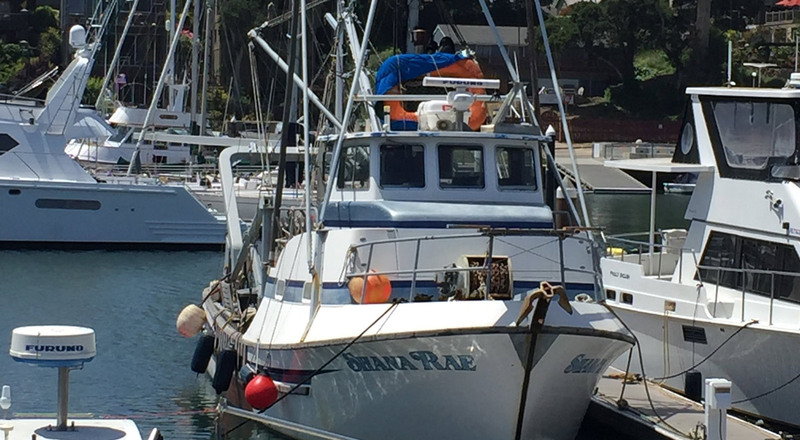 Chao and Flexas have extracted regional data corresponding to Monterey Bay from the two numerical models described above, ROMS and LLC. These times series, containing output of temperature, salinity and velocities, have been implemented in the prototype shore planner discussed below. We are in the process of writing software that will extract output from these simulations that mimic the sampling capabilities of our gliders and AUVs. Figure 2 provides and example of the resolution available from the LLC model. Chao is working to develop a 300 m ROMS model that will increase resolution by approximately a factor of 10. 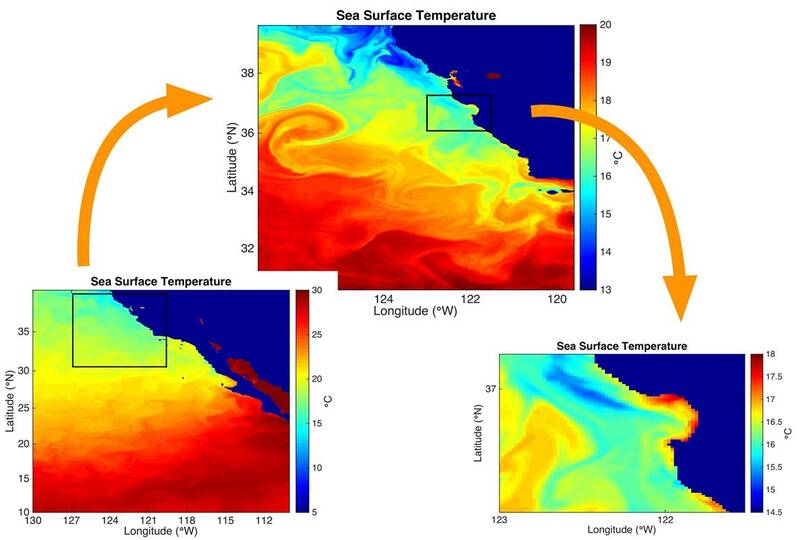 Figure 2: From left to right, successive images of sea surface temperature off the California Coast, zooming in to Monterey Bay. The middle and right panels show images corresponding to the boxed regions in the previous panels. Note the change in color scale across the different panels. A prototype shore planner was integrated with the ROMS simulation. This integration was tested within the context of existing software developed for path planning of vertically-profiling EM-APEX floats. This earlier work is described in several publications [Troesch et al 2016a, Troesch et al. 2016b]. An initial analysis has been carried out to evaluate the sensitivity of the model-based path planning to the accuracy of the model’s velocity field. This study was performed using a series of ROMS models with forecasts further into the future in order to degrade model accuracy. This study covered both batch and continuous re-planning techniques. A paper was submitted describing the results of this sensitivity study [Troesch et al. 2016c]. The prior shore planner, designed for control of vertically-profiling floats, was subsequently extended to more general vehicle motions, e.g. 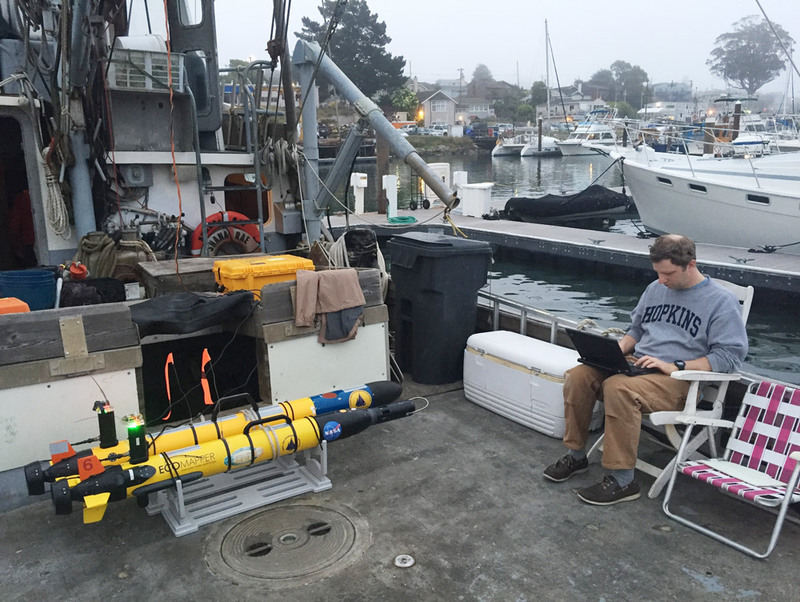 AUVs, Seagliders and Wave Gliders. Specifically, this path planning software is designed to target specific coverage templates (e.g. transects and bowties). Infrastructure was developed to test the ability of the virtual assets to achieve the coverage templates over space and time. A preliminary set of science-based coverage templates was received from the science team, including the desired shape (e.g. bowties, transects) and size of the template. These were analyzed within the target deployment domain of Monterey Bay [Branch et al. 2016]. Based on this simulation analysis the coverage strategies have been refined under the direction of the science PI Thompson. Figure 3 shows the coverage analysis for two Seagliders performing orthogonal diagonal transects along a 15km E-W by 15km N-S box centered on the relevant target point using ROMS sample days in April 2015 in the Monterey Bay area. Green pins indicate target locations where both Seagliders were able to complete two (e.g. down and back) legs within a nominal time of 48 hours. The yellow pins mean that only one of the two diagonal out and back transect pairs succeeded. The red pins mean that both of the two diagonals failed. As the data shows, locations off-shore are more likely to fail to achieve the nominal transects. We are currently working with the science team to iterate on the field program target areas and sampling strategy based on this analysis, in order to increase the measurement success rate. Figure 3: Preliminary Seaglider transect feasibility analysis for Monterey Bay domain. Green = both diagonal transects succeeded, yellow = one succeeded, red = neither succeeded. M. Troesch, S. Chien, Y. Chao and J. Farrara. Planning and control of marine floats in the presence of dynamic, uncertain currents, Proc Intl Conference on Automated Planning and Scheduling, London, UK, June 2016. M. Troesch, S. Chien, Y. Chao and J. Farrara, Active Control of Marine Vehicles in the Presence of Strong, Dynamic, Uncertain Currents, Workshop on Planning for Hybrid Systems, 30th AAAI Conference on Artificial Intelligence, Phoenix, AZ, February 2016. Hill, C., D. Menemenlis, B. Ciotti, and C. Henze, 2007: Investigating solution convergence in a global ocean model using a 2048-processor cluster of distributed shared memory machines. Scientific Programming, 15, 107–115. Losch, M., D. Menemenlis, P. Heimbach, J.-M. Campin, and C. Hill, 2010: On the formulation of sea-ice models. Part 1: Effects of different solver implementations and parameterizations. Ocean Model., 33, 129–144. Marshall, J., A. Adcroft, C. Hill, L. Perelman, and C. Heisey, 1997: A finite-volume, incompressible Navier-Stokes model for studies of the ocean on parallel computers. J. Geophys. Res., 102, 5753–5766. Menemenlis, D., J. Campin, P. Heimbach, C. Hill, T. Lee, A. Nguyen, M. Schodlok, and H. Zhang, 2008: ECCO2: High resolution global ocean and sea ice data synthesis. Mercator Ocean Quarterly Newsletter, 31, 13–21. Menemenlis, D., C. Hill, A. Adcroft, J. Campin, B. Cheng, B. Ciotti, I. Fukumori, P. Heimbach, C. Henze, A. Koehl, T. Lee, D. Stammer, J. Taft, and J. Zhang, 2005: NASA supercomputer improves prospects for ocean climate research. Eos Trans. AGU, 86, 89, 95–96. Menemenlis, D., C. Hill, G. Forget, C. H. B. Nelson, B. Ciotti, and A. Chaudhuri, 2014: Global llcXXXX simulations with tides. Presentation at annual ECCO meeting, avail. at http://ecco2.org/meetings/2014/Jan_MIT/presentations/ThursdayPM/05_menemenlis.pdf.